What are YOU Celebrating on MLK Monday? WHAT WOULD DR KING DO? He might call for Doctor’s Trials, to include all complicit in the maimings and killings of injured workers in America?! How long would it take? Not Long……THINK LOCALLY. OCCUPY VIRTUALLY.Do you ever wonder about Corporate Responsibility toward #InjuredWorkers and corporate executive complicity in any crimes that cause egregious harm to injured workers, allegedly insured under such policies? 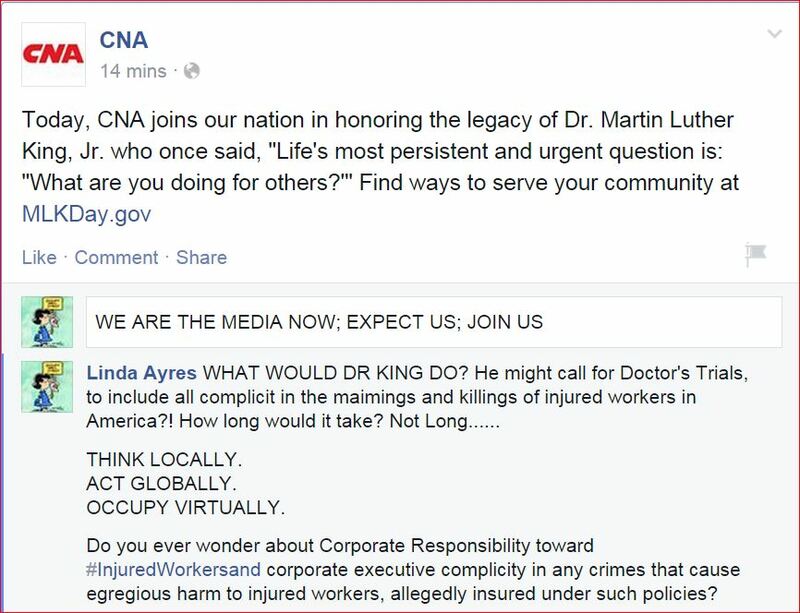 IF a corporation, such as WyndhamWorldwide, faithfully pays #WorkComp premiums to a #WorkComp Insurance Carrier, such as @CNA, which uses the law firm of Grancell Stander and UR firm of Corvel Corp and it’s leased/owned doctors et al to deny reasonably necessary medical treatment to injured workers, such as Linda Ayres and does everything possible to not only deny medical care, but acts aggressively to ensure the impossibilities of return to work, uses legal chicanery to breach fiduciary responsibilities and funny book-keeping to allege compliance with law, cost shifting insurance company liabilities to California State Taxpayers, and causing an EPIC FAIL of the spirit of WorkComp Law….to provide immediate reasonable and appropriate medical care in order to return employee to work as soon as possible…..WOULD THAT BE LEGAL? In fact, the case of Ayres vs Wyndham has similarities to the Romano Trust/Ralph’s Market/Sedgwick denials of medical care to Charles Romano, also in California, in which a shoulder injury resulted in the death of Romano, with attempts for indictments of insurance company patsys, and resulted in merely a $100,000, lots and lots of legal fees, and essentially, a State Issued license to kill injured workers? Ayres is still alive and fighting back. FRIENDS DON’T LET FRIENDS FIGHT ALONE. Here, read and share these blogs….. with friends and enemies. Nothing more to see here, Citizen…. Move along…. Meanwhile, immune systems breaking down everywhere, heart conditions, cancers…all very positive for profits, huh? Kids today don’t get protection, huh? Thank the #ProNukers, too! Follow the money trail…does it lead to Langley? Protect your horsies, too. Dead races horses blamed on what? Thank the #ProNukers & the 25 rules of disinformation? What did you learn since March 11, 2011 about the #ProNukers and the 1,946 known lethal isotopes and the #meltdowns? Why did you listen to the pro-nuker liars who told you repeatedly, ‘there is no immediate danger’….? NOT A LEAK. It is time for “Doctor’s Trials” … this time to include all complicit #sonderkommando & those who license them, huh? Prepare the gallows..
← “WE ARE THE MEDIA NOW” LUCY OCCUPY SAID…..